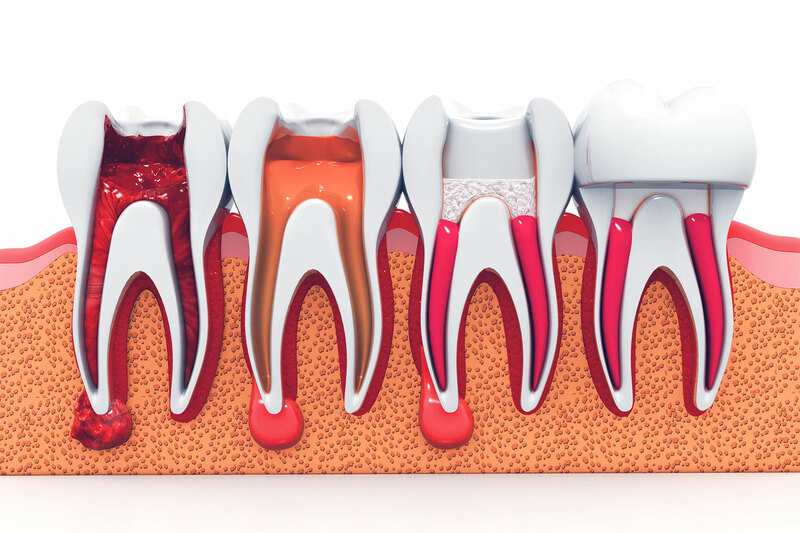 Endodontic therapy, also known as root canal therapy, is the treatment for an infected pulp of a tooth. Root canal therapy successful eliminates an infection and protects the tooth from becoming contaminated in the future. According to the American Association of Endodontists, millions of teeth are treated and saved via root canal therapy. Contrary to what you may have heard, root canals are not meant to torture you! The word root canal therapy may be scary, but don’t be afraid! Root canal therapy is necessary to save teeth that are severely infected. The procedure removes bacteria and dead tissue from inside the infected tooth. South Gables Dental can effectively treat an infected tooth that needs root canal therapy. You’re in a good hands! WHEN IS ROOT CANAL THERAPY NEEDED? Root canal therapy is generally needed when there is a deep infection inside one of your permanent teeth. Your tooth’s pulp can become infected from an injury or because of an untreated cavity that becomes severely infected. If you do not get treatment for this type of infection, it can become severe enough that your tooth will need to be removed. The infected tooth is numbed. Sometimes a dental dam is used to isolate the tooth so that it remains dry during the procedure. We will then drill into the tooth from the top to access the infected pulp. Using a dental file, we will remove the infected area. We will shape the inside area and disinfect it to prevent further infection. After we thoroughly clean the area, we will fill the hole with a special material. We will then fill the top of the tooth with a temporary filling before a crown is implemented. After a few weeks, we will place the permanent crown on top of the tooth. Make a dental appointment today at our Coral Gables office!